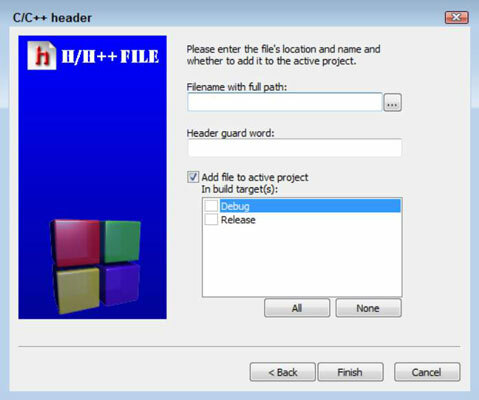 1Right-click main.c in the Projects tab of the Management window and choose Remove File From Project from the context menu that appears. Code::Blocks removes the file from the project tree. You see the New from Template dialog box shown. 3Highlight the C/C++ Header icon and click Go. You see the Welcome page of the C/C++ Header wizard. 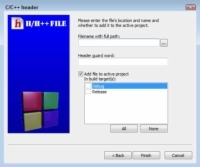 The wizard asks you to provide the header configuration information. 5In the Filename with Full Path field, type MathLibrary.h, click the ellipses button, and then click Save. Code::Blocks adds the complete project path to the filename you chose. Notice that Code::Blocks also supplies an entry for the Header Guard Word field. This word ensures that the header isn’t added more than once to a project. 6Click All, and then click Finish. 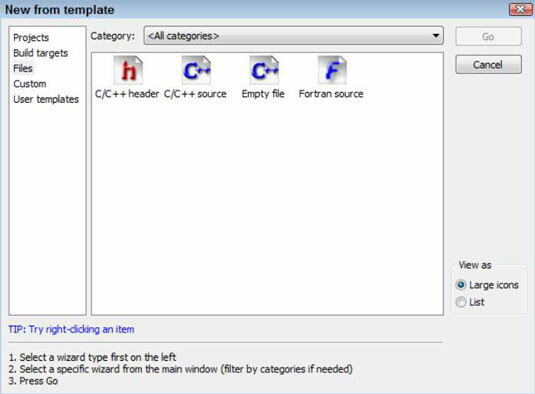 The C/C++ Source wizard adds the file to your project. You’re ready to begin creating a template library.